Dutch costumes of Assendelft, of North Holland. Home » Dutch costumes of Assendelft, of North Holland. 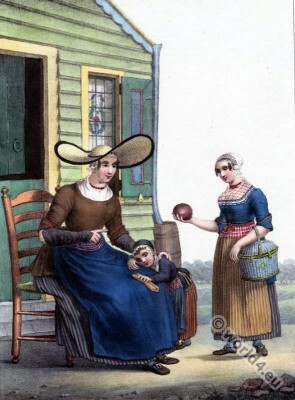 Dutch costumes of Assendelft, of North Holland, 1828. A Farmer with her child, and a girl of Assendelft, of North Holland. Une Paysanne avec son enfant, et une jeune fille de Assendelft, de la nord Hollande. This entry was posted in 1828, 19th Century, Dutch and tagged Netherlands national costumes, Traditional dutch costumes on 2/9/16 by world4.